The following post was written by Jessica Crawford, America Forward’s Director of Strategic Partnerships, Juanita Tolliver, America Forward Manager, and Sarah Groh, America Forward Manager. The solutions to our nation’s most intractable problems are out there, waiting to be tapped, and the time is ripe to translate these local solutions into national change. Together we can leverage social innovation to make government and policy more responsive and reflective of the local solutions that are delivering results and lasting change every day in communities from Baltimore to Des Moines. America Forward’s Presidential engagement efforts are critical. As you may know, in 2008 New Profit’s America Forward team was able to galvanize the sector to bring amazing partners into our coalition and in front of candidates to secure key policy wins early in the new administration, like the creation of the Social Innovation Fund. While the 2016 Presidential election cycle looks considerably different from the 2008 cycle, one thing is certain – it is essential that we cut through partisan rhetoric to showcase the powerful cross-sector solutions happening in communities across the country. Since the release of our Moving America Forward: Innovators Lead the Way to Unlocking America’s Potential Presidential Briefing Book in October 2015, our team has been working in key states leading site visits, round table discussions and briefings with candidates and senior policy staffers on both sides of the aisle, and our Coalition members. Moreover, we’ve been highlighting a new narrative – making the case for what’s possible if we come together as a nation to leverage evidence-based, bi-partisan, pragmatic policy ideas and community solutions that are delivering solutions to our biggest challenges in education, youth development, workforce development, poverty alleviation, and government efficiency – and we’re talking to everyone! We’re calling every campaign and we’re engaging every staffer that we reach. We’re offering up tailored policy ideas related to social innovation and community solutions, Pay for Success, and the neuroscience of trauma and learning; highlighting examples of what works in public, private, and non-profit partnerships; and sharing data about just how strong community solutions can be. We’re talking to folks on both sides of the aisle, we’re engaging our Coalition as proof points of what works on the ground, and we’re positioning America Forward and New Profit as thought-leaders in the sector. To supplement our ongoing outreach to candidates, we've made a conscious decision to create our own dialogue by taking to print and online media to tell a different story about the potential of community solutions that reach across the aisle and can be translated into national change. We're thrilled to kick off partnerships with leading education news outlet the 74 Million and Forbes/Grads of Life Voice, a blog dedicated to exploring workforce development and youth development topics. Click here to see our most recently published op-eds and blog posts. We’ve also launched a Presidential Blog Series highlighting the phenomenal work of our Coalition members and partners, and their recommendations for the next President. Together, we are creating a powerful and hopeful narrative about what the future of our country could be. As the major political parties gather in Ohio and Pennsylvania next month for their nominating conventions, the America Forward Coalition and New Profit network will be ramping up our field engagement efforts to amplify the critical stories of the individuals who will be directly impacted by the policy outcomes and decisions of the next President – especially as it relates to higher education. On June 28th in Columbus, Ohio, and on July 19th in Philadelphia, Pennsylvania, America Forward will bring together college students, recent graduates, representatives of presidential hopefuls, policymakers, institutional administrators, and thought-leaders to discuss these barriers, as well as the effective, innovative community solutions to these challenges for a series of Today’s Student Town Halls. You see, today’s college students are not just 18 – 24 year-olds enrolling in four-year colleges fresh out of high school. Today’s students come from varied backgrounds and face multiple challenges to accessing and completing college. America Forward believes the next presidential should enable students to attain marketable post-secondary credentials by addressing barriers to post-secondary completion such as transportation, childcare, and food insecurity. We invite you to join us for these town halls. 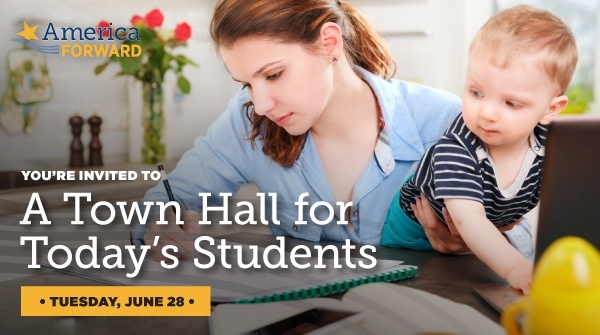 You can sign up to attend our Today’s Student Town Halls and join the conversation using #TodaysStudent! The next President will write a new paradigm with long lasting social and economic implications. Thank you for joining us in challenging the next President to spark a new era of problem solving that transcends partisanship. Be sure to follow the conversation @AmericaForward using #AFPresidential16.